1693 Entire addressed "These ffor ye Right Worshippll. Sr John Moore att his house in Mincing lane in London present" with, on the reverse, a fine London Bishop mark for 'IA/17'. 1781 Entire from Elsenor, Denmark to Ely, Scotland showing very fine Foreign Office and Inland Bishop marks for SE/18 and 18/SE. 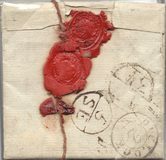 1801 Entire from "Smiddygreen" addressed to Edinburgh with, on the reverse, a straight line CRAILL in black and, on the front, a Bishop mark for AP/22 in Red. 1775 Entire to London redirected to Surrey showing a fine Type 3a TEMPLE OFFICE DOCKWRA for 'PAYD/PENY/POST/T/MO' with REVERSED 'N' in PENY - known Mondays only - L 357a. 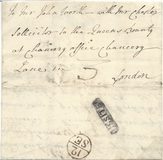 1781 Entire addressed to Lutterworth showing on the reverse a very fine Type 4 SOUTHWARK OFFICE Dockwra for 'S/TU', L 354. 1707 Fragile Entire addressed "To Mr Lewis Aiton/Merchant/in London" showing an OVAL EDINBURGH BISHOP MARK and a very fine London Bishop mark for AP/4. 1766 Entire headed "BENTLEY" addressed to London via Farnham showing a very fine straight-line FARNHAM and London Bishop mark for 11/DE, SY 276. Earliest Known Date. 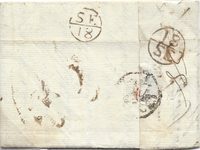 1711 Entire to London from WORPLESDON (Surrey) with, on the reverse, a fine London Bishop mark for DE/18. 1772 Post Paid entire to London showing a fine straight line CAMBRIDGE, CB 26, and a very fine London Bishop mark for 17/DE. 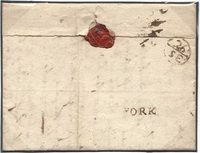 1708 Entire addressed "To Jn Moore Esqr at Shalford Hall" and "To be left at Mr Osborne a Baker In Braintree, Essex" showing a London Bishop mark for AV/31. 1700 Entire from Appleby addressed "This to Mr John Moor Cheesemonger at Sir John Moors House in Mincin lane London" showing a fine London Bishop mark for NO/6. 1686 ENTIRE FROM "COLD OVTON" (COLD OVERTON), Leicestershire, addressed "For the Right Worshipful Sr John Moore at his house in Mincing Lane, London" showing a very fine LONDON Bishop mark for IV/10. 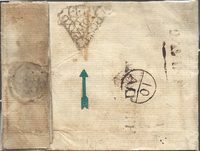 1732 Entire addressed to Whitehall, London with, on the reverse, a very fine straight line DUBLIN AND 'IA/20' DUBLIN BISHOP MARK. 1668 Entire from Hasleborow (Hasleborough), Northants?, addressed "To Mr Jno Moore Ald" this dld in Lnd" (London) showing a very fine London Bishop mark for 'IA/26'. MS 3. 1776 WINDOW LETTER from Ewell addressed to the "Foundling Hospital, London" showing a very oval-framed 'WL'. L 203. On the reverse are very fine Bishop marks for both 17/SE and 18/SE. 1722 Entire to "The Treasury Chambers near Whitehall London" showing a fine and EARLY STRAIGHT LINE BEDALE, YK 215. 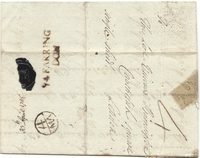 1787 PACKET LETTER addressed to KINGSTON, JAMAICA showing on the reverse a fine London Bishop mark for '7/MR, manuscript "1/-" - late use of Bishop mark. 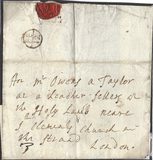 1712 Entire from London addressed " To the Rt. Hon.ble the Lord Coningsby at Hampton court by Lempster bag in Herefordshire" showing a London Bishop mark and a very fine LONDON RECEIVER OFFICE 'B' FOR CARLTON HOUSE. 1673 Entire addressed "Ffor his much esteemed friend John Morris Esqr in the Old Jury these in London", showing a very fine London Bishop mark for MA/16.